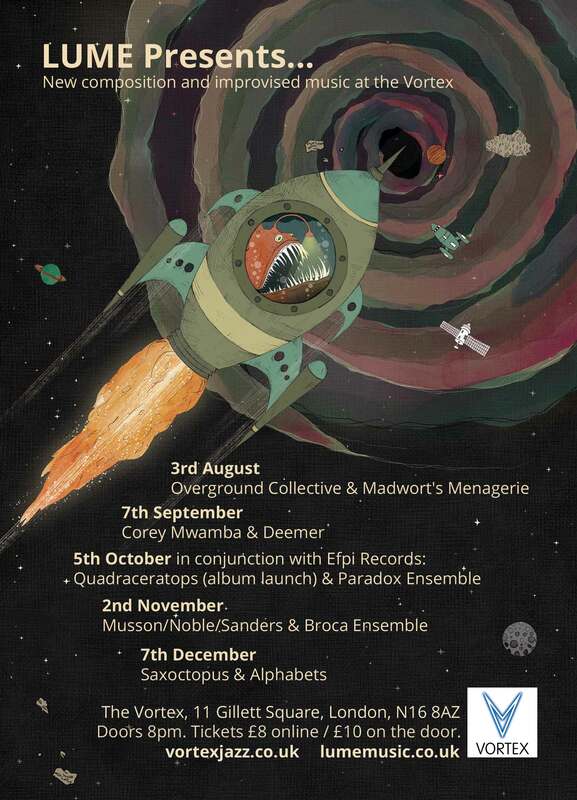 We’re very excited to announce a new venture for late Summer and Autumn 2014: ‘LUME Presents…’ at the Vortex in Dalston! We will be hosting monthly double bills of our favourite musicians every first Sunday of the month starting on August 3rd. Join us for an extra dose of great original and improvised music…and a great excuse for some brand new artwork from the amazing Peter Beatty! Tickets are on sale from the Vortex website. This entry was posted in Announcements, bass, bass clarinets, Death Star?, drums, electronics, flutes, for once no table moving!, grooves, guitars, improv, joy, keyboardfest, laptops, magic, massive lineup, overcrowding, pandemonium, saxes, space fish, strings, trombones, trumpets, vibes, Vortex! on June 30, 2014 by cath.